One of the best ways to understand how value is perceived is by looking at how it can be used to create illusions. 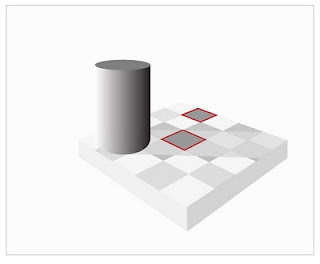 There is a popular video on youtube showing a pretty cool illusion involving a scene similar to the one you see to the right. The illusion is one where a light tile is moved over a dark one and they turn out to be the same value. If you haven't see the illusion click on the link below to watch. Before we look at the scene let's just examine the checkerboard to see how the illusion is created. 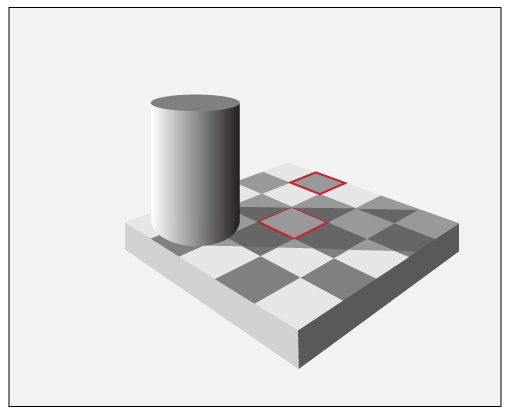 Looking at the two squares highlighted in red, one appears to be a darker square than the other. 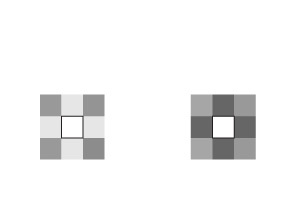 If we isolate the two squares on the checker board and reduce the value level of the other squares, the values of the two squares begin to appear similar.  If we remove the other squares altogether, we will see the two isolated squares are exactly the same value level. The illusion is created by placing squares of different value levels around each one. 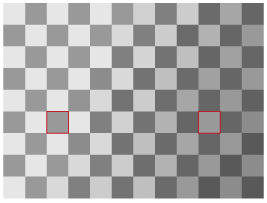 The square on the left of the checkerboard is designed to be a dark square, so the squares surrounding it are of equal value or lighter. The square square on the right of the checkerboard is designed to be a light square, so it is surrounded by squares of equal value or darker. The perceived value level is dependent on the values near or surrounding the value field. Now let's look at the illusion occurring in the video. What the creators of this video did was set up a checkerboard pattern with a large simple cylinder set in one corner of the board. They then lit the scene to have the cylinder cast a shadow across the checkerboard. The trick of this illusion will be in the value level of each tile. The local value of tiles in the shadow are adjusted to still appear as if the shadow is the only thing causing the value change. Where, in actuality, the values of the squares, comparing light to light tile and dark to dark tile, are different. At first glance, the two tiles the video focuses on look very different. The tile highlighted in the shadow appears to be a light tile while the one in the back appears to be a dark one. But isolating them reveals that they are the same value. As explained above, the trick is in the value levels of the tiles around each one. 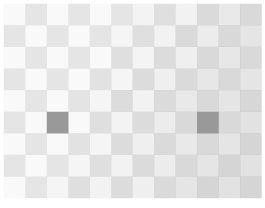 Darker values placed next to a tile will make it appear light and lighter values next to the tile will make it appear darker. The eye is fooled into thinking the value difference is only because of the cast shadow. The illusion is then created.